The Wright Wreport: From NYFW Spring 2017 Day 6: It's Zang Toi, of Course There Are Glories to Behold (and It's in the Bag); What's Not to Like at Chiara Boni La Petite Robe; Miguel Vieira Is an Established Do-Gooder. From NYFW Spring 2017 Day 6: It's Zang Toi, of Course There Are Glories to Behold (and It's in the Bag); What's Not to Like at Chiara Boni La Petite Robe; Miguel Vieira Is an Established Do-Gooder. From the Zang Toi Spring 2017 collection. Photos by Maria C. Boyes. ZANG Toi’s Spring 2017 colleciton is a stroll through Monet's gardens at Giverny (France), emanating lilac hues and wistful embellishments that are like a breath of fresh air. Utilizing romantic florals and ladylike silhouettes, ZT knows how to dress a woman. His clean, classic lines are enriched with sumptuous silks and cashmere knits making this collection one that will be talked about for years to come. For day, he gives a twist on the trench coat, sometimes creating shortened sleeves or loosening the shape to kimono-like volume, all in black Loro Piana weather silk. 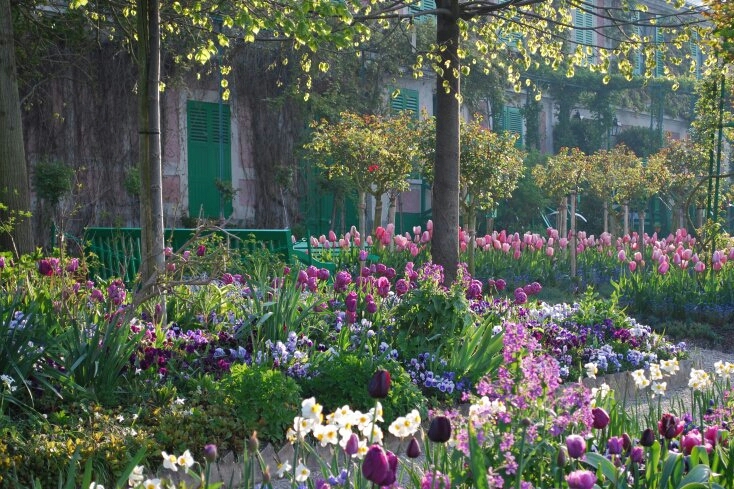 View in spring of the flower garden, Clos Normand, in front of Monet's house in Giverny, France. 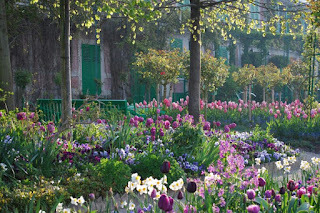 Photo by Ariane Caudelier courtesy of Giverny.org. He chooses, on other occasions, to take the sleeves off all together and pair it, belted, with a high-waisted lean pant. For evening, he lengthens it to the floor in black silk satin opened to reveal a violet floral lining. Dresses are where the color comes alive, for both day and night. Violet and lilac are often paired in color-block designs, while shoulders and waists are encrusted with beads, gemstones and embroidery. Sculpted jackets and cardigans are bordered with silk pansies or flowing wisteria. Particularly dramatic is a knit sheath dress in a deep violet emblazoned with hand-encrusted gemstones on cap sleeves and replicated on a choker. ZT’s signature ballgowns are a fantasy come to life. In addition to the floor-length trench gowns, the designer offers myriad wisteria-embellished ensembles, both embroidered and in prints. The strapless lilac gown in silk gazaar with a violet border at the hem is a singular beauty. Topping it is an abbreviated hand-loomed cardigan in silk cashmere embroidered with cascading wisteria on the shoulders. Truly, ZT Spring 2017 is a work of art (and so are the Papyrus greeting cards in the giftbag).